We are proud to be a full line Snapper/Simplicity dealer in our three stores. The Snapper/Simplicity line offers a wide range of lawn, garden, and snow removal equipment that will give the user years of dependable service. Our sales professionals are here to help you select the Snapper/Simplicity model that will best fit your lawn, garden, and snow blowing projects. Regardless of the size of your projects, Snapper/Simplicity and Kramer Ace Hardware have the equipment to suit your needs. 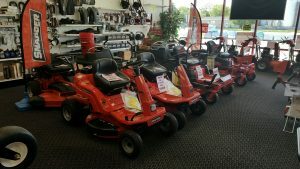 Selecting a Lawnmower: Selecting the proper lawn mowing equipment begins with your visit to any one of our three stores. We need to know the size and complexity of your mowing project before we suggest the model of Snapper to fit your needs. Lawns with a lot of landscaping and other obstructions may require a walk-mower as well as a rider and we have models to fit every need. Walk-mowers come in regular push mowers as well as self-propelled models, with features such as "3-N-1" convertibility so you can choose side discharge, mulching, as well as bagging. Snapper's full line of riding mowers offers this same "3-N-1" convertibility in a variety of sizes to suit your yard and personal comfort. And when speed and maneuverability are needed we can show you the features in the Snapper's nine-models of zero-turn riding mowers. 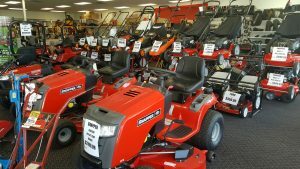 Once you have made your choice of the equipment to fit your needs we will have your mower serviced and ready to run before delivery. We will also make sure you understand how to operate it safely and efficiently, offer maintenance tips, and provide skilled factory trained and authorized maintenance. You will NOT find this level of service at the big-box store that has a few mowers beside their front door and little or no expert assistance with your purchase. The Rest of the Snapper/Simplicity Line: Here in North Iowa we have more than lawns to maintain. 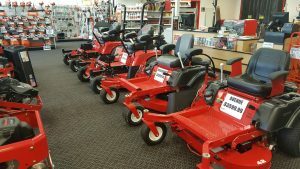 Snapper/Simplicity offers a wide variety of garden tillers, front and rear tine, portable generators, snow throwers and power washers. We offer a full line of Snapper/Simplicity equipment and when the weather turns cold we have all of the Simplicity snow blowing equipment assembled, serviced, and ready to deliver. Don't let the cold weather and heavy snow leave you with a snow shovel and aching back, let Simplicity and Kramer Hardware take the work out of removing snow from your property, regardless of size and scope.